SGS240 SPOOL ON GUN SYSTEM. The SGS240 spool on gun system is the ideal equipment to attach to your mig welder for welding aluminium, mild steel or stainless steel. There are less feeding problems than using conventional welding torches (especially with soft wires such as aluminium), and the 8 meter lead means you can weld further away from the mig welder. This means welding inside trailers and welding at high levels is much easier. The SGS240 spool on gun system can be used on any mig welding machine with a euro connector. There is no control box, and it requires no seperate auxcillary supply to run it, making it very easy to set up and use. It can be transferred from one machine to another very easily. The gun uses standard MB24 binzel type consumables and takes a standard 102mm spool of wire. It has wire speed control on the gun, giving you a very smooth accurate wire feed with easy adjustment. Welding Voltage range 15-44V (Max Open circuit volts: 90Vdc). 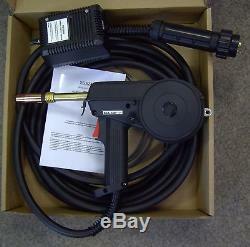 Different versions of this unit are available including a 360 amp spool on gun and ones which. Fit a machine without a euro or without a wire feed unit, this connects straight onto a power source and has a built in gas solenoid. This version is ideal for making good use of redundant power sources. Many other variations are possible on request. PLEASE VIEW OUR OTHER ITEMS FOR SALE INCLUDING VARIOUS OTHER MIG AND TIG TORCHES, AND A UNIVERSAL WIRE FEED ASSEMBLY KIT, AND GAS SOLENOIDS. We have been designing, building and repairing all types of welding equipment in the UK for over 20 years. All new machines are built to a very high standard, using quality components and all comply with CE requirements. Conditions of return to base (RTB) warrenty are as follows: The machine will be repaired free of parts and labour for 1 year from the date of dispatch from our works. Tec arc will pay for return to the customer. There will be a charge if the fault or damage has been caused by mis-use by the purchaser or if no faults can be found with the machine. Because we design and manufacture welding machines, parts are kept in stocked, on our premises, and full technical back up is given if required. Any of our products can be demonstrated and collected at our premises. Any further information you require about us or any of our products please message me. The item "SGS240 UNIVERSAL SPOOL ON GUN SYSTEM ideal for mig welding ali" is in sale since Monday, January 21, 2019. This item is in the category "Business, Office & Industrial\Metalworking/Milling/Welding\Welding & Soldering\Welding\Welders, Cutters & Torches\TIG Welders". The seller is "yorweldsupplies" and is located in YORK, North Yorkshire. This item can be shipped worldwide.